We’d feel right at home in the Tower of Babel. I’ve been hearing it repeated several times a day. This morning, for example, he glued down a loose bit of wallpaper by one of the new door frames, than glued 4 mopboard tiles around the same frames, fixed a loose tile going into the pantry, removed, shimmed and reattached 2 kitchen cabinet doors that didn’t close quite tightly enough, adjusted a ceiling fixture and hung 2 new cabinet doors. While we wait for the weather to get warm enough to go on to the next project. In between doing all the little bits, he’s finishing the kitchen. I can finally retire those blue cabinet curtains that were only supposed to last a month or two. The door on the left went on this morning. 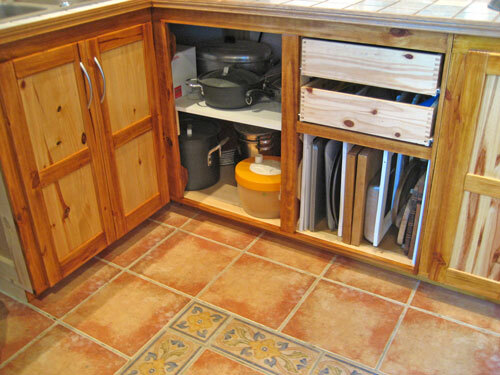 That leaves the doors and drawer fronts you see in the center, plus doors on 2 upper cabinets. Then the kitchen will be officially done. 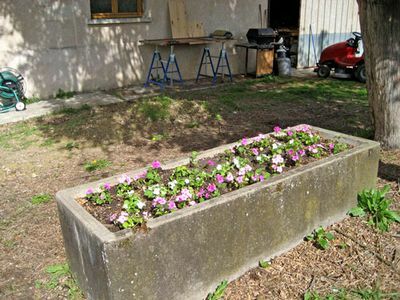 We had one nice day last week so I got a few herbs planted and transplanted fron last year’s cow trough. I can’t do seeds yet, as it still gets cold at night but I did plant a few flower bulbs. Other signs of warmer weather are appearing: The barn door is open; the summer worktable is out (old door on pretty blue sawhorses), the barbecue grill is out, waiting for a new gas tank. And my forsythia finally bloomed – a bit late this year. It looked better before all the wind and rain yesterday, but, that’s spring! For those of you careful readers, you might have picked up on the fact that, when I made the Garlic Meatballs with Angel Hair Pasta I braised extra garlic. I agonized over what to do with it (Ha!). I decided I hadn’t done decadent in awhile. Heat water in a medium pot for gnocchi. When boiling, add the gnocchi and cook just until they all float, 1 – 2 minutes. Drain and rinse lightly with cool water. Heat butter and oil in a medium nonstick skillet. Add gnocchi and sauté until light brown. small baking dish. Cover and bake for 60 minutes at 325F (160C). It’s been sunny all day…. Tomorrow I may be lucky enough to be able to mow the lawn! Your industry, both of you, amazes me. Everything is looking great, inside and out! Happy Spring! Looks delicious. Your website is taking over my kitchen. Beautiful! And I LOVE your outdoor worktable! 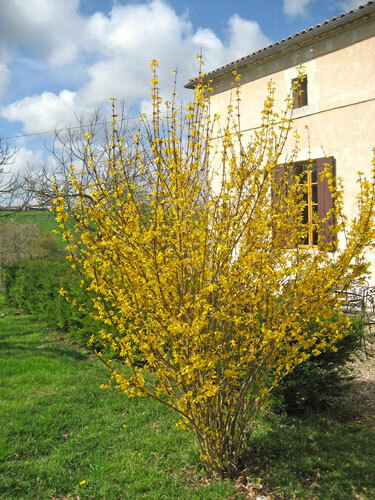 Our forsythia is about 3 weeks early, so we are on a par this year with my favorite corner of France. 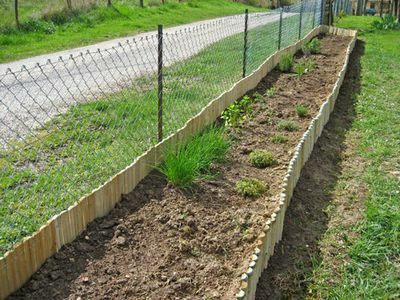 Looks like your chives are coming up – I’ll have to go check mine. Garlic and mascarpone is brilliant! Our forsythia too is in full bloom, plus my chives and some weak rosemary plants. I need to work hard on my herb garden this year. I am so fortunate to have a source for huge herb plants for $3.00 each. Your chicken looks lovely and it is good to see the grill out and ready for wonderful meals. Happy Spring Katie. I would love this dish Katie. I have some potato gnocchi that I made that I have never thought of serving fried. Ina, I killed my last forsythia… I’m so happy this one is doing well. Cindy, nothing like new sawhorses to start the spring off right! Mimi, the chives are up and even been transplanted and well-used. They were early…. 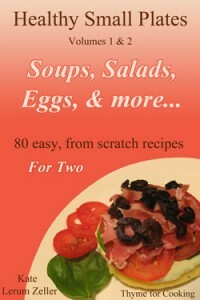 Val, I loved fried gnocchi – it gets light as a feather! You guys are multi-tasking like crazy! Spring, apparently, has that effect on everyone except me. My gosh, great post! The chicken dish looks delicious and you have been might busy in the garden. Can’t wait until flowers are in bloom here! Love that forsythia! Hi Katie Everything is looking great and the dish Yum. I love gnocchi. The sage and brown butter is my favourite. I love that dish! You are a cook after my own heart! Love garlic too and lots of it! Have you planted any purslane (mâche)? Love your backyard…and I think the garlic puree make the dish very flavorsome…and with the earthy mushroom…too good! What an excellent phrase to be hearing! I like to make to-do lists with boxes beside each item and check each off as it’s done. I find it so satisfying to say out loud “Check!”. Our forsythia just sent out its blossoms as well. I can’t decide if it’s early, late, or right on time. But it does look stunningly beautiful – especially today as it is raining. There’s something about the brilliant yellow blossoms juxtaposed against the slate blue clouds. I have chive envy. Your chives are much higher than ours. 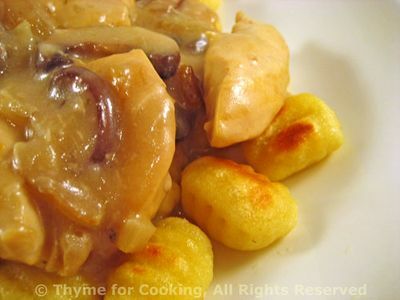 The chicken with gnocchi sounds wonderful. Love the new door on for the cabinet! I also love the open shelving and drawers! Joanne, and when you fry them they get light as a feather…. Multi-tasking – another way of saying can’t concentrate on anything…. Tasteofbeirut, I didn’t plant any, but I can get lots at the markets…. My garden wasn’t ready – the the bunnies were. Tigerfish, garlic is always good! Lannae, great progress this week – thanks to the warm weather.